Over ten hours of daylight now. With the sun shining throughout the day, it was really noticeable. No matter how big the snow piles are, they shrink fast before the long February sun. Soon the sap will be running, and not long after that will come the first signs of spring. My dog Matika and I went for a walk late this afternoon. Even though I’d put in a full day’s work, there was still enough light left for us to head out. 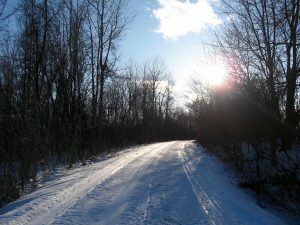 We followed the Rail Trail, groomed for snowmobiles, far enough away from the road to escape the sound of passing cars. Then the simple beauty of late winter took over: blue sky, leafless trees, pristine snow, and that blazing sun. When I was younger, I didn’t much care for this time of year. That’s because I focused on the cold. 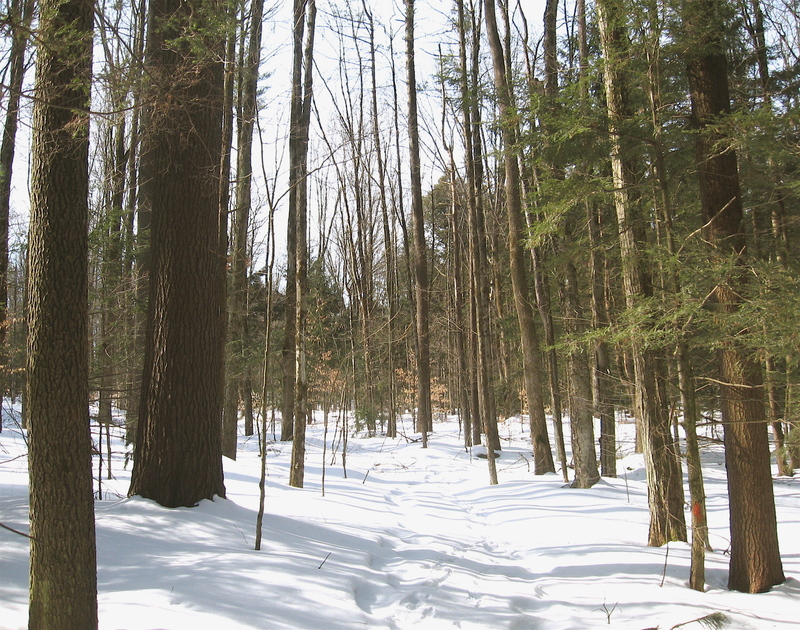 But the clean, clear sky – so often on full display here in New England during the winter – has gradually won me over. And while I will always prefer the green world to the white one, this season no longer feels like something I must simply endure. The long February sun. 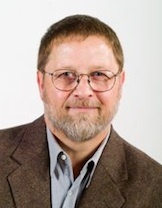 Over four decades ago I was deeply depressed, and it was this sun that reignited the spark of hope in me. Shortly after that, I was back with the living again, and have been ever since. The sun can work miracles. Now back indoors, with the last bit of light gone, I go about my business with renewed strength. That’s because the sun still burns deep within me. I am alive and well in an elemental world, and that’s no small thing. I have seen the light. When the holidays are in the rear view mirror and it’s too soon to dream about spring, a walk through the woods is just an excuse to get out of the house and blow off those stinky thoughts. I try to do it at least once a week despite whatever’s luring me to my writing desk. It’s simply a matter of good health. A snowstorm is coming but I can’t wait for it to turn this grey of mine world into a wonderland. I have to get out now. 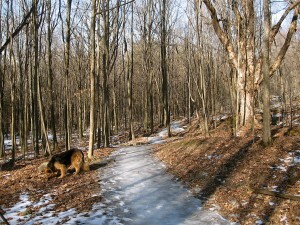 So off I go with my dog Matika to commune with frigid nature. Entering the woods, I am surprised to find not one or two but three downy woodpeckers hard at work, trying to extract whatever sustenance they can from dead trees. They telegraph survival through the quiet woods. I wish I could direct them somehow to the fatty suet that’s dangling outside my kitchen window. 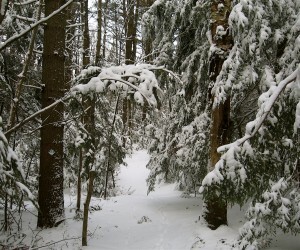 There is a stark beauty to the winter forest, even when hardly any snow covers the ground. It is the same kind of beauty one finds in the desert or at sea year round. Not all beauty is lush and vibrant. The rivulets that spring from the rocks are suspended in time. They won’t run again until temps get above freezing again. God only knows when that will be. 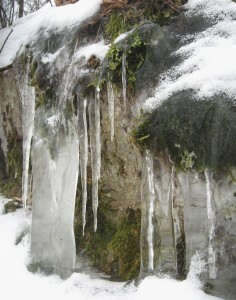 But the dangling icicles are magnificent all the same. I revel in it because, well, that’s all I have right now – that, the woodpeckers, and the creaky trunks of leafless trees all around me. Not all the trees are naked. A copse of young beeches still sport hundreds of dry, ochre leaves that rattle in the wind. They sound like the ghosts of last summer. “This too shall pass,” they say to me. Yes, I am listening. And with each icy step I take, I move closer to the next warm season. I am accustomed to winter now, expecting the cold to sting my cheeks and the rime to gather on my beard as I finish my walk. I return home soon enough. A day later, while writing this, I sip tea while watching the snow fall outside. Strangely enough, I prefer this to living in Florida. Go figure. Winter persists. A Nor’easter dumped over a foot of snow on northern New England this week, followed by an all-too-familiar cold snap. But the March sun melts the ice with ease at midday, and lingers into early evening. There is hope for us yet. The equinox, after all, is only four days away. My dog Matika was so restless this morning that I had no choice but to take her out for a run. She was my excuse, anyhow. Where to go? Usually I gravitate to the woods, but today I went to the lake. If I can’t have warmth and greenery, then give me blue sky and sunlight. 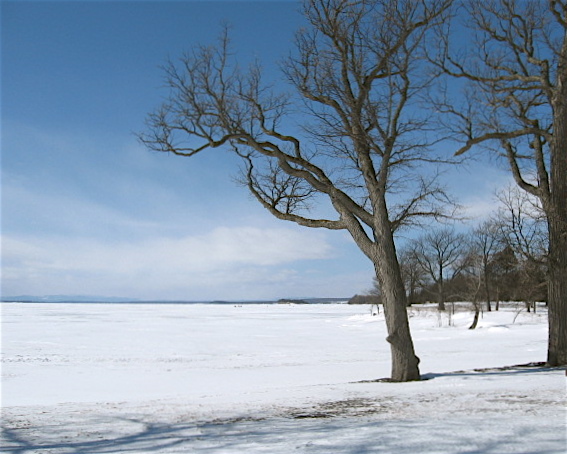 A wicked north wind greeted me as I stepped out of my car and walked to the edge of Lake Champlain. It was iced over as far as the eye could see. I tossed a ball for Matika while trudging across the icy ground between snowdrifts. Judy had warned me about this bitter, lakeshore cold. But I ventured into it anyway, chasing the light. 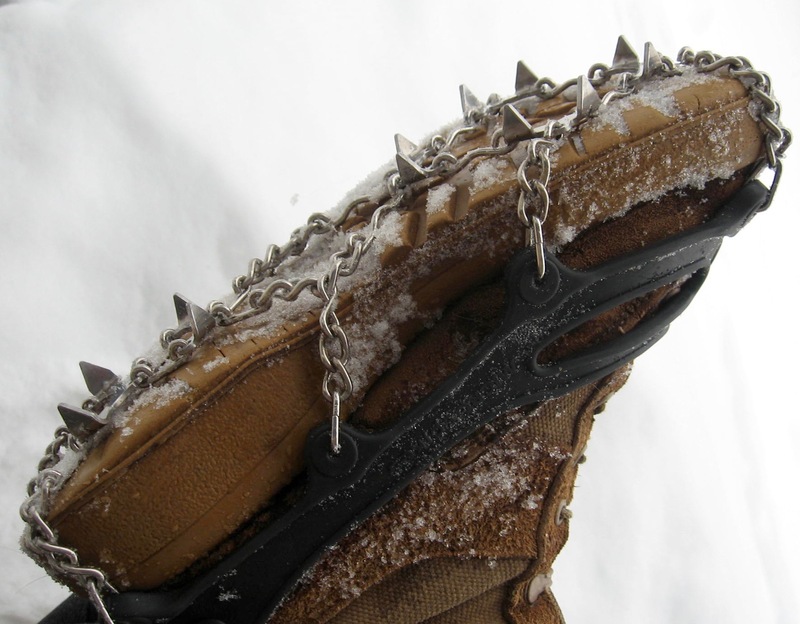 The many tracks in the snow assured me that Matika and I weren’t alone in our restlessness. A few hardy ice fishermen stood motionless on the bay ice despite the cold. For a moment I imagined lake water lapping gently to shore before me as it had the last time I was here. My eyes watered as the wind blew, urging me to cut my walk short. Oblivious to the cold, Matika kept running after the ball. Clouds appeared on the western horizon and that was it for me. Back inside for another day. Spring will arrive soon, the optimist in me kept thinking. And I smiled when I saw a shamrock decoration plastered to the window of a house during my drive home. Yes, spring will arrive soon, very soon. It has been a long winter, colder than any in memory, and I have a case of cabin fever that won’t quit. That’s why I went out this morning after a round of writing, despite the fact that it got down to 3 below zero last night. By the time I’d pulled on several layers of wool clothing and had slipped out the door, it was 10 above zero. Still very cold for early March, but it would have to do. Matika was as happy as I was to get out of the house. She ran circles around me as I tramped a hard-packed trail cutting through the woods. She disappeared momentarily. When I found her she was chewing on the bones of a deer that hadn’t survived the winter. The tracks of several other wild animals crisscrossed the trail. This time of year, they could only be doing one thing: looking for food. That made me realize just how easy I have it. Grumble all I want about this long, cold season, at least I’m well fed. The fresh air, bright sunlight, and forest silence work wonders on me regardless of the time of year, no matter what the thermometer says. It was good getting out this morning, and I was just a little disappointed when I’d finished the loop and had returned to the car. So soon? Not the daylong excursion that I so desperately need, but good enough for now. Patience, patience. Spring isn’t far away. In a few more weeks, Matika and I will be slogging through cold mud. Then we’ll be in our glory. The lack of snow is making a lot of Vermonters grumpy these days. Even those of us who don’t ski are missing the white stuff. Vermont in the winter isn’t same without a blanket of white. Oh sure, there’s snow in the mountains and the ski areas are making their own, but here in the valley we get a dusting that melts with the next sunny day. Then the ground is half-naked again. It’s unsettling. Snow or no, I went for a walk the other day. I went to Aldis Hill as I usually do when I’m short on time but need a woods fix. I was shocked to find the trail a solid mass of ice and immediately regretted not bringing my Yaktraks. 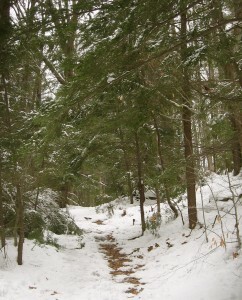 I slipped and slid along, often leaving the trail for better footing yet returning to it out of sheer habit. I crept along slowly. That helped. Matika didn’t mind, of course. Any time out-of-doors is a good time for her. Then again, she wasn’t on the trail itself. I slipped and took a hard fall at one point. No surprise there. Got up and immediately checked to see if anything was broken. A slight abrasion on my hand, that’s all. A few minutes later, I slid ten feet. After that I tramped through the woods back to the car. 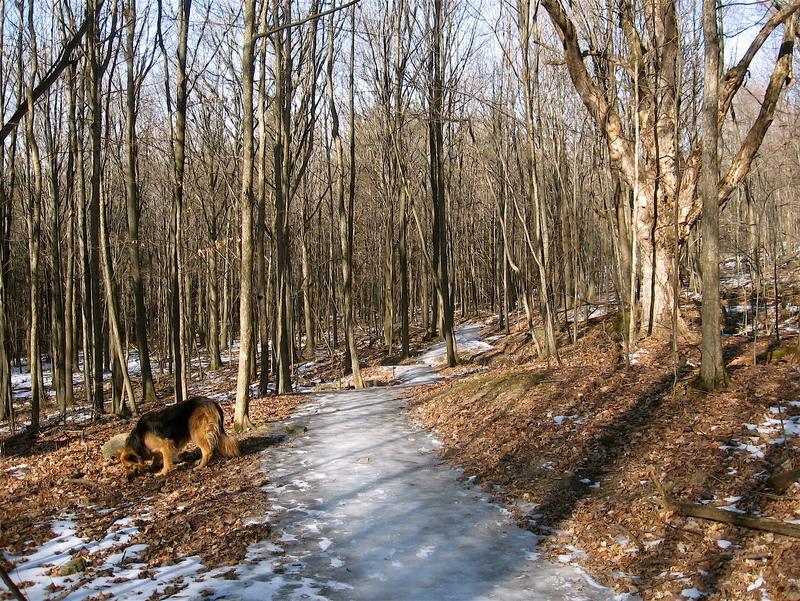 An icy trail isn’t a trail, really. 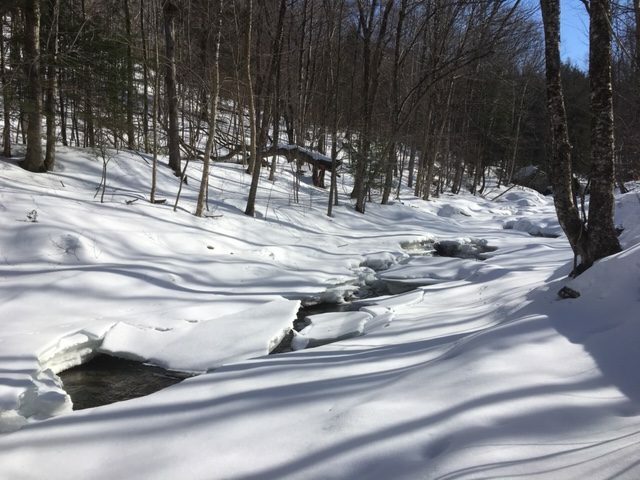 It’s a river of ice reminding three-season hikers like me that winter is fundamentally inhospitable. This one is for sure. So now it’s just an impatient wait until springtime. Fortunately, in a year like this, that can’t be far away. 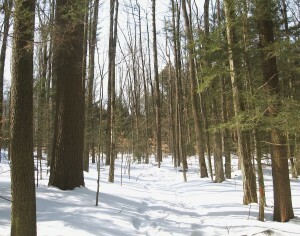 A change in weather over the weekend reminded me that it gets cold here in Vermont – wicked cold. Temps dropped below zero, and my enthusiasm for a long-awaited hike on my day off dropped with it. I awoke Monday morning to single digits. Warmer, but not warm. So I puttered about the house while the mercury climbed. By late morning it was 10 degrees Fahrenheit. Hmm… that would have to do. I put on four layers of wools and thermals beneath my shell and went out. A town forest twenty minutes from home seemed like the place to go. I wasn’t in the mood to drive any farther than that. Commuting to work every day does that to you. Told Judy before leaving the house that I’d be glad to be in the woods once I was there. That was true but the chill that came when I broke a sweat kept me from lingering. I walked about an hour through the forest, cutting tracks through several inches of fresh snow, then called it quits. Outside just long enough for my beard to ice over. No more. My dog Matika would have stayed out longer. 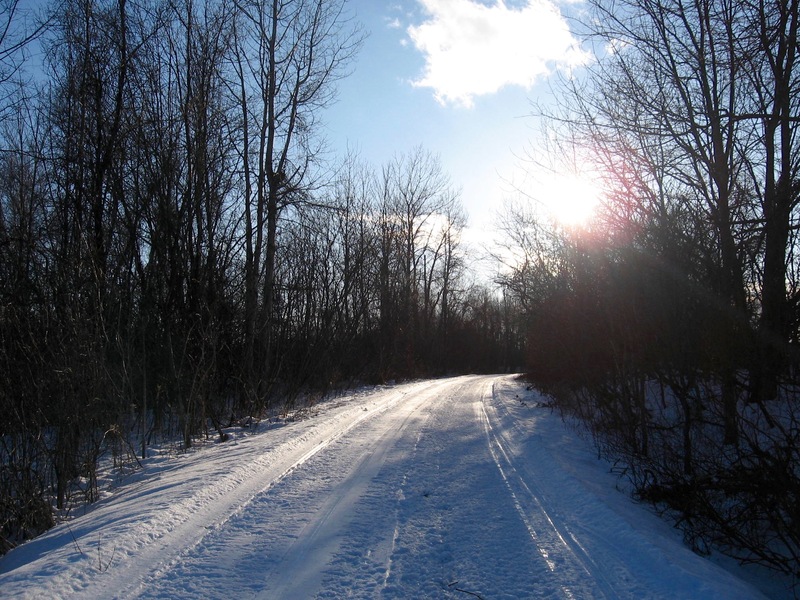 Tracks of deer, squirrel, field mouse, you name it – there was plenty to sniff. She ran back and forth through the snow like she was born to it. Yeah, she has a heavy winter coat as most long haired German shepherds do. Had the place all to myself for an hour. That was nice. Enjoyed the way the sun broke through the trees when the clouds opened up, and the way the snow clung to the boughs of conifers when they didn’t. But it was just a tad too cold to reflect upon the wonders of wild nature any more than that. Fixed cup of hot chocolate as soon as I got home, then thawed out. It wasn’t enough of a hike to blow away all my stinky, mid-winter thoughts, but it would have to do. For now, that is. Next time I have a day off from work and temps rise into the twenties, I’ll go out for a much longer walk. No doubt Matika will be ready to roll when I do.